Mung Dal, also spelled Moong Dal, is a split uncoated seed of Vigna radiata native to Indian subcontinent. Whole mung beans are used to make Dal. Beside being used as staple dal or pulse, mung beans is used in many versatile dishes around the world, For example, it is used as dessert paste in Chinese food, as ice-cream, as starch, as jelly noodle, in Filipino soup, in Malaysian snacks and as bean sprouts. 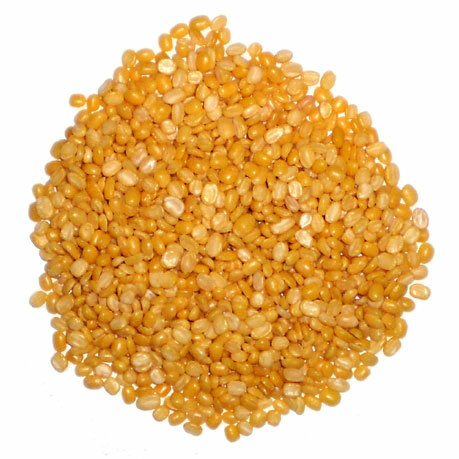 Mung Dal Khichadi is considered to be one of the ancient recipes using this bean. To make Khichadi, mung dal is with cooked rice (sometime chickpeas) to giving a thick soupy dish flavored by turmeric (and lime). Mung dal is also popular eaten as snack “Dalmoth or Dal Moth”. Dal moth is prepared by soaking mung dal in water, then partially drying, followed by frying and seasoning with salt and spices. Mung dal, along with besan, is also used as batter for many crispy fried appetizers.